Montgomery Nursing & Rehabilitation Center has been working with United Scripts for just over a year. We are very pleased with the level of service delivered by United Scripts in particular the 24 by 7 round the clock delivery service. All things considered, the biggest benefit we've realized in our relationship with United Scripts is the significant cost savings we've realized. United Scripts is a valued business partner of Montgomery Nursing & Rehabilitation Center. 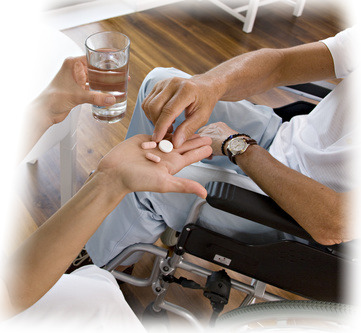 Our focus on long-term care pharmacy services uniquely positions United Scripts to address the specialized pharmacy care requirements of nursing home and other skilled nursing care facilities. The pharmacy staff at United Scripts welcomes the opportunity to consult with your staff to understand your patient/resident specific infusion requirements to put together a cost-effective solution for your long-term care operation. United Scripts works closely with skilled nursing care operators to ensure that the nursing staff is equipped with the right tools to handle a patient/resident’s medical needs to ensure that patient care is never compromised. Convenience boxes can save your staff valuable time in treating patients. In addition, we can provide customized specialty boxes based on your specific facility and patient needs. Specialty boxes take the form of customized emergency boxes, customized general medications boxes, and I.V. supplies. If you believe that your long-term care operation could benefit from United Scripts Pharmacy Services, please complete the brief Contact Us form on the About page and describe your area of interest. We would be happy to provide a no cost assessment of your operations to develop a plan to help your organization achieve its service and cost reduction goals.